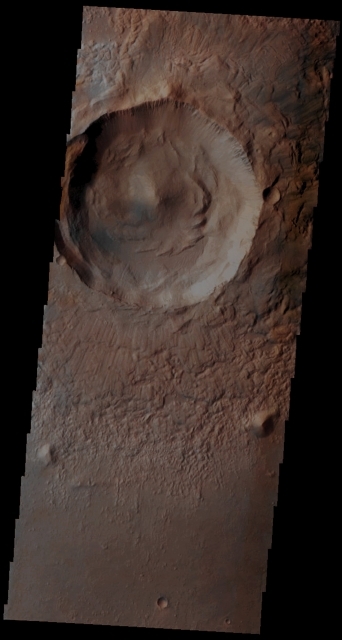 In this simply wonderful VIS image, taken by the NASA - Mars Odyssey Orbiter on September, 26th, 2002, and during its 3.467th orbit around the Red Planet, we can see (almost entirely) an Unnamed Impact Crater located in the Martian Northern Hemisphere's Region known as Utopia Planitia. If you pay attention to the North/Eastern portion of the Inner Rim (from about 11 until 3 o'clock of the Margin) of this Unnamed Crater, you will be able to notice the presence of deep and well defined Gullies. A short and very smooth - at least apparently - Uplift can be seen in the center of this Impact Feature while, almost all over its Floor, the remnants of what seems to be a long series of Ancient and Massive Landslides - which ended-up by overlapping one another -, can also easily be spotted and, in our opinion, as IPF, better studied. One (small and relatively recent) Impact Crater can be seen characterizing the Eastern Rim of the larger Impact Feature, at abouit 3 o'clock of the frame; furthermore, on the Southern Portion of the highly irregular (almost "chaotic, in a way) Outer Slopes of this Unnamed Impact Crater (which, perhaps, in a far and distant past formed some sort of a Pedestal), two (maybe Ejecta but we, as IPF, do not think so) Boulders, stand clean and clear on the very end of the aforementioned Slopes. The first Boulder, almost buried, irregularly shaped and small in size, lays on the left (Sx - Eastern Portion) of the Margin of the Slopes, while the second one, definitly much bigger and shaped like a "cone" or even, if you look closer, like a "little Pyramid", can be seen to the right (Dx - Western Portion) of the Margin of the Slopes. Last notation: to the very South, once the Crater-related Features are over and the Terrain apears to be smooth and regular, one last tiny (and old) Impact Crater (whose Floor is almost fully covered by Sand and Dust) can be seen. This image (which is an Original Mars Odyssey Orbiter false colors and Map-Projected frame published on the NASA - Planetary Photojournal with the ID n. PIA 19021) has been additionally processed, magnified to aid the visibility of the details, contrast enhanced and sharpened, Gamma corrected and then re-colorized in Absolute Natural Colors (such as the colors that a normal human eye would actually perceive if someone were onboard the NASA - Mars Odyssey Orbiter and then looked down, towards the Surface of Mars), by using an original technique created - and, in time, dramatically improved - by the Lunar Explorer Italia Team.